Opinion Piece: The Why and How of Music. Our fascination with melodies and rhythms, sounds and timbers pre-dates Ancient times. In fact, music has been in existence for some 40,000-odd years, perhaps even much longer, according to some scientists. David Byrne’s How Music Works is a fascinating read which unearths a ton of insights on the history and essence of music. In it, Byrne, the former frontman of the American band rock band Talking Heads, shows how even nature is inextricably linked with music. For example, different species of birds occupy different strata of the audible spectrum. And on a sad note, we can even attribute gaps in this spectrum to now-extinct species. But our love for music also transcends scientific explanation. How Music Works and many other works of literature describe the cultural and religious impacts of music around the world. In many ways, music is often seen to be sacred – enjoyable, certainly, but also much more than just that. Even who you are as a person may be, if not shaped by, at least in some part correlated to, the music you listen to. 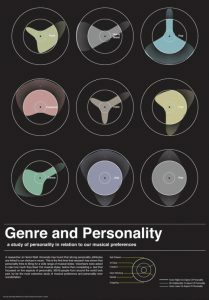 Large scale studies have shown that personality traits are significantly linked to music genre preferences. Now, time for something a bit different – a thought experiment, if you will. It goes without saying that good music often paints a picture with its textures and melodies; indeed, it tells a particular story. So let’s take one of our favourite instrumental tracks for the moment – one that cannot say anything literally, but which speaks volumes nonetheless, by virtue of its song title, arrangement and composition. What might its story sound like? It’s easy to take a guess. . .
It’s Sunday morning in Sheffield. The pattering rain outside is barely perceptible over the sound of an 8-bar melody playing on repeat through the speakers on Ryan’s desk, as he works tirelessly on his computer to add, tweak and perfect the drum work on the unfinished project he’s just started. In the corner of the room, a single ray of light peeks through the grey, desolate cloud cover outside, making its way into his bedroom studio, illuminating a single dusty vinyl record nearly entirely hidden beneath a stack of scribbled, crinkled study notes. But Ryan is too focused to notice anything. He channels all of his frustration and sadness, his melancholy and introspection into his music, poring over minute details until, at last, the song is finally completed. He takes one last listen, and knows immediately what he’ll call it. Failed Exams. One may never know whether or not the story or image a certain song depicts for them is at all the same as how its creator envisioned it to be. But how is it even possible, let alone common, for us to be able to visualize our favourite songs? How is it that we’re immediately reminded of the beach on a sunny day by one song, of that one dream vacation we took by another, and of our favourite childhood hangout spot by another one still? For one, it’s been proven that the emotions created by music are in fact “cross modal” – that is, they can spread from one sensory system to another, and so are often manifested visually as well as sonically, for example. And music has a strong link to memories, too; there’s even an official term for this – music-evoked autobiographical memories. In fact, the brain has actually been shown to track tonal progressions in the same region of the prefrontal cortex as it experiences the memories. 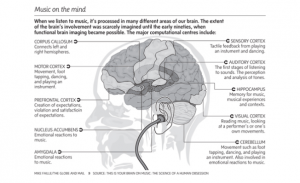 Science has myriad explanations for why music is as important to us as it is. But perhaps the most intuitive explanation for the power of music is its all-encompassing nature: Music is that which connects us – a universal language that can be understood and appreciated by all. In that sense, maybe it’s not such a mystery. Lou Rauls once said, “music is the greatest communication in the world,” and that it is. It’s resonant, it’s unifying, it’s powerful. And most importantly, it’s all of what we are.